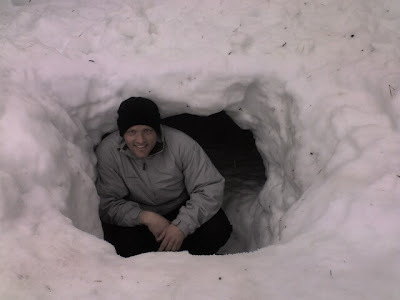 Matt Ludlow in the snow cave. So they built a "snow cave" similar to an igloo. You dig it out of the side of a snow hill and leave a small opening. It was supposedly going to keep them much warmer than a tent would. Dave said it took them three hours to dig, ouch! 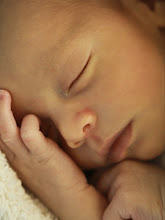 But he did confirm that he slept great and it really didn't get that cold. I was so proud of him! He had a great time getting to know all the young men that came on the trip. We really don't have many young men anymore, only like 15 total. Matt Ludlow and him are over the teachers and I think they've got two guys. Oh well, those two will get a lot of attention! 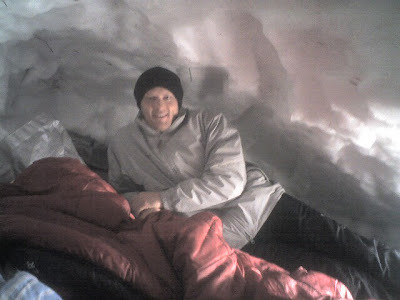 Matt in the opening of the snow cave. 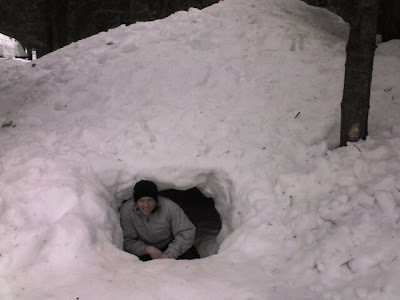 A larger view of the snow cave. Looks like ZERO fun to me. I HATE being cold. 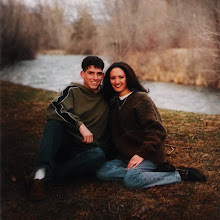 Looking at the pictures just made me cold. Brrrrrrr! 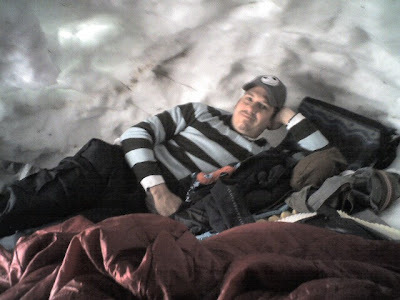 Yeah, I don't think I could do the whole snow camping thing! I would just be so scared that while sleeping the snow cave would collapse! Ahh...it freaks me out just thinking about it! 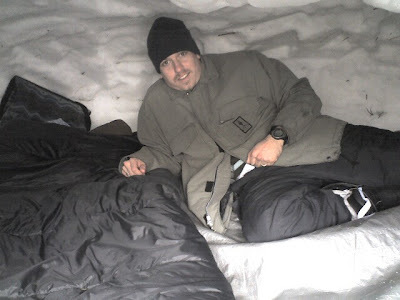 I can't think of anything I would hat more than snow camping! I'm sure the guys loved it though. It's totally something corey would love to do! I bet that Dave can't wait for your boys to get bigger so they can dko all that fun stuff together! Doug has tried to get me to go camping every winter. I say "no." Doug's in Young Men's too. 15 young men sound amazing! There are only 6 in our ward. That is sooo cool. Would I want to do it? Not really, but what a fun thing for the boys to go do. Next time you need to have him take all your boys so you can have a nice break. Do you all have Father & Sons campouts out there? If not I think you should suggest it!